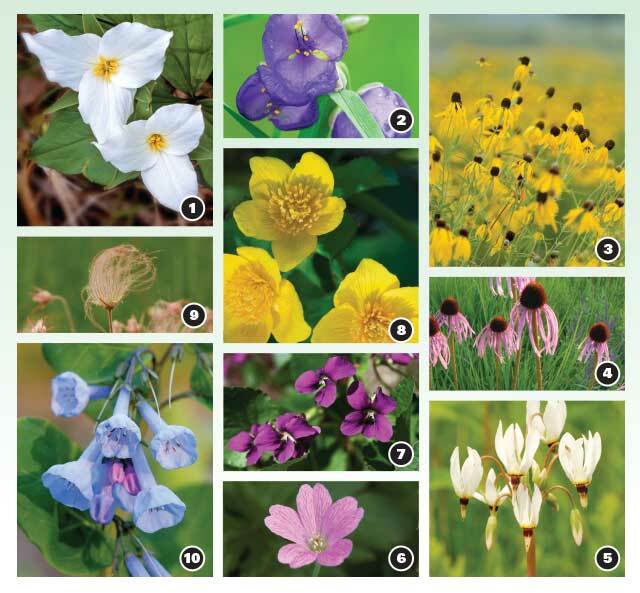 From the first ephemerals that live out their lives before tree leaves unfurl, to the last prairie flowers blooming before frost, the native wildflowers of Illinois are an extraordinary treasure of our landscape. Ten of our favorites are pictured below. Can you match each with its name? No peeking! Answers located below the picture. 1. Great White Trillium, Trillium grandiflorum, is a member of the lily family, and a spring ephemeral that enjoys dappled sunlight in woodlands throughout Illinois. 2. Spiderwort, Tradescantia, and its many cousins, are seen throughout Illinois prairies and forests; some forms are threatened. Its blooms last about six weeks, April through August. 3. Brown-Eyed Susan, a member of the aster family, blooms in late summer for about 2 months, in many different ecosystems throughout the state. 4. Purple Coneflower, Echinacea purpurea, part of the aster family, blooms in mid-summer for about a month and may re-bloom in early fall. It’s found mostly in northeastern Illinois, often in woodland openings and restored prairies. 5. Shooting Star, Dodecatheon meadia, a member of the primrose family, blooms for about a month in late spring, in Illinois prairies, river bluffs, woods and fields. 6. Wild Geranium, Geranium maculatum, grows abundantly throughout Illinois woodlands, blooming April through June. 7. Purple Violet, Violet viola, Illinois’ state flower, has hundreds of cousins, all growing in abundance throughout Illinois, in full sun and shade, in all types of soil. Talk about resilience! 8. Marsh Marigold, Caltha palustris, part of the buttercup family, blooms in the northern two-thirds of the state in moist woodlands, April through June. 9. Prairie Smoke, Geum triflorum, is a member of the rose family found only in northern parts of Illinois, and even there, it’s scarce. It blooms early to late spring for one to two months, and afterwards develops its distinctive long and feathery tails. 10. Virginia Bluebells, Mertensia virginica, belong to the borage family and bloom throughout the state in mid- to late spring in moist, lightly shaded areas. This entry was posted on Friday, April 12th, 2013 at 12:00 pm	and is filed under Northwest Quiz. You can follow any responses to this entry through the RSS 2.0 feed. Both comments and pings are currently closed.